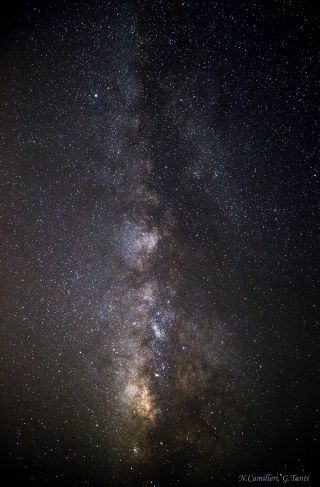 Noel Camilleri captured this image of the Milky Way on Aug. 12, 2013 from Mtahleb, Malta. The Milky Way shines brightly in two stunning images taken from the island of Malta. Noel Camilleri shot the first image, which features the Milky Way galaxy’s brilliant band of dazzling light, on Aug. 12 from Mtahleb, Malta, using a Canon camera mounted on a tripod, 4 x 13 second exposures, 5 x 13 second darks with ISO at 2500, 24 mm lens at F4.5. "A glance up at the night sky reveals a broad, irregular patch of light— described by the ancients as a river, as milk, and as a path," Camilleri told SPACE.com via email. "In reality, this intriguing line of light is the center of our galaxy (left part of image), as seen from one of its outer arms." This image of the Milky Way, sent to SPACE.com by photographer Noel Camilleri, features the constellations Sagittarius and Serpens (the Serpent). Camilleri took this photo from Mtahleb, Malta on Sept. 7, 2013. The photographer aimed her camera at the center of the galaxy, toward the constellations Sagittarius and Serpens (the Serpent), in the second photo. The picture was captured from Mtahleb on Sept. 7 using Canon camera mounted on a tripod, 10 x 8 second light-frames, 2 x 8 second dark frames, 50 mm lens at F2,8 and ISO2000. A barred spiral galaxy comprising roughly 400 billion stars, the Milky Way stretches between 100,000 to 120,000 light-years in diameter. A light-year is the distance light travels in one year, or about 6 trillion miles (10 trillion kilometers).